The Saco Food Pantry opened its doors in 1982 as the Biddeford-Saco Council of Churches Food Pantry. It continued for many years as such, until the Council disbanded in 2002. 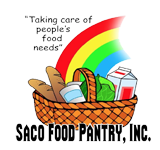 At that time it incorporated and became the Saco Food Pantry, Inc. It is a nonprofit organization with a tax-exempt status under section 501(c)(3) of the Internal Revenue Code. The Saco Food Pantry provides food for local Mainers in need through short-term and intermittent help, and long-term help for those experiencing continued difficulties. It is run by a volunteer staff which includes a Board of Directors. It currently provides food for over 8,000 people a year, more than 96,000 individual meals!